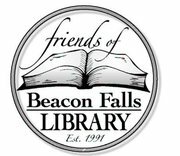 The Friends of Beacon Falls Library accepts donations of books and media in good marketable condition for the semi-annual book sales. In most instances these donations should be made within a month of the scheduled sale and can be dropped off at the library during regular library hours. Pick-up can be arranged by calling the library at (203) 729-1441. Donations should not be placed in library book drops. Donations of magazines, Readers Digest condensed books, encyclopedias and audio cassette or VHS tapes will not be accepted. It should be understood that once the item is donated, its handling is at the Friends’ discretion and may be donated to another organization or discarded if it cannot be sold. The Library Director may choose to accept donations at other times of the year, as space permits. Upon request, donors may receive a letter outlining the contents and condition of donations. The Library cannot assess or suggest a value for non-monetary gifts for income tax or other purposes. On occasion, the Beacon Falls Public Library accepts unsolicited gifts (books, etc.) All gifts to be considered must be inspected by the Director. Final acceptance is subject to approval by the Director. The donor should be aware of the fact that the library may either keep, dispose of, or sell the gift. Also the changing needs of the library could, at some future time, necessitate the removal or relocation of the gift. The library does not assume any costs of transportation, placement, or storage of any gift.